No mechanical seal lasts forever. To increase sealing reliability sometimes double seals have been installed. However, double seals cannot be considered as “safety” seals, since both seals are installed at the same time and thus have the same running time. No manufacturer can guarantee that the second seal will hold after the first one has failed. Even the “Disaster Bushings” required by the oil industry (API) offer no leakage protection after a seal failure. 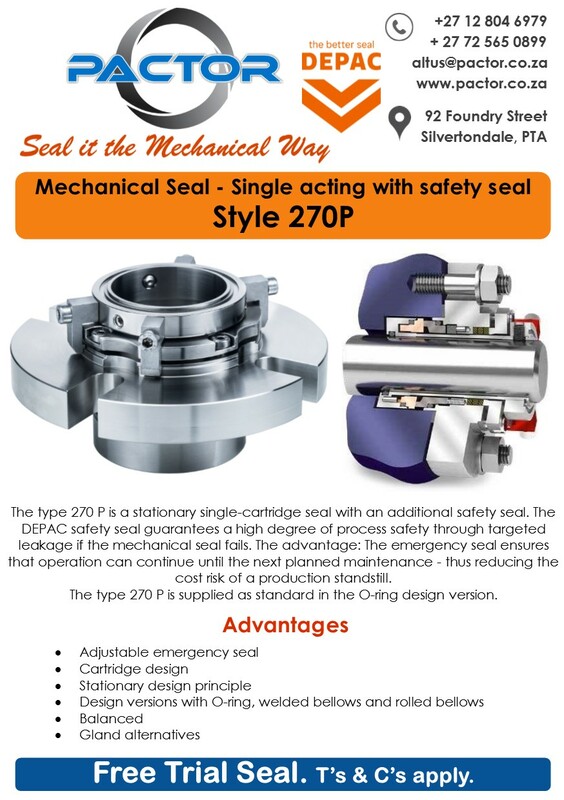 Through controllable leakage, DEPAC’s safety seals guarantee a high level of process safety even after a possible seal failure. The emergency seal can be adjusted to an acceptable leakage rate and operated until the next planned shut down.In extreme conditions, where a double seal is required, an additional safety seal can be offered as well. The extra charge for a DEPAC safety seal has no relation to the costs occurred due to an unscheduled production shut down! FEP encaps., Chemraz, Kalrez, Aflas, etc. Other sizes, materials or design variations upon request.